McMenamins Grand Lodge in Forest Grove, Oregon is like a dream. The surreal kind that makes no sense when you wake up and even less when you try and describe it to your friends. It's like no other place we've ever stayed, and still renders me speechless. How many hotels can you say that about? Even the most luxurious hotels in the world grow on you in the first few days as you ever-so-easily slip into the exquisite amenities and lifestyle of the rich and famous. That's not hard to do at all. No, McMenamins Forest Grove hotel is nothing like that. Staying true to their brand and maintaining the historic nature of all of their properties, what McMenamins has done at the Grand Lodge would surely make the Masons proud. Staying here is like waking up from that dream to find you're 10 years old again. That's the best way I can describe it. If you had a happy childhood like I did, you’d no doubt join me in trading a few days of your adulthood to travel back and do it again. Trust me, you’d beg your parents to take you here. But that’s what makes the Grand Lodge hotel so special - you really can go back and feel like a kid again - no magic dust or acid trip required (although pot is legal in Oregon, just sayin). The Lodge itself has a long and interesting history in the Pacific Northwest. Formerly a Masonic Rest Home, it was built in 1922 by the Oregon Masonic Lodge to house the widows, children, and infirm surviving family of their members who'd passed on. When the Masonic Home was built, Forest Grove was just a sleepy farm town outside of Portland. Today, the community has grown to nearly 25,000, supported by agriculture, the Tualatin Valley and Willamette Valley wine industry, and tech giant Intel just down the road. And while the Masonic Lodge may be somewhat of a mystery to some, there's no denying the good works they've done for centuries throughout the country and continue to do today. When the Masons decided to move their home in Forest Grove, the McMenamin family - famous for their uniquely restored historic hotels in Oregon and Washington - purchased the property and worked their magic. A separate Children's Cottage adjacent to the Grand Lodge was completed in 1926, but then closed in 1927, at least to children. It seems having kids around all the time wasn't the best idea for a rest home, so eventually the children were sent to live with outside families. But today kids of all ages are welcome and there's plenty for them to do. 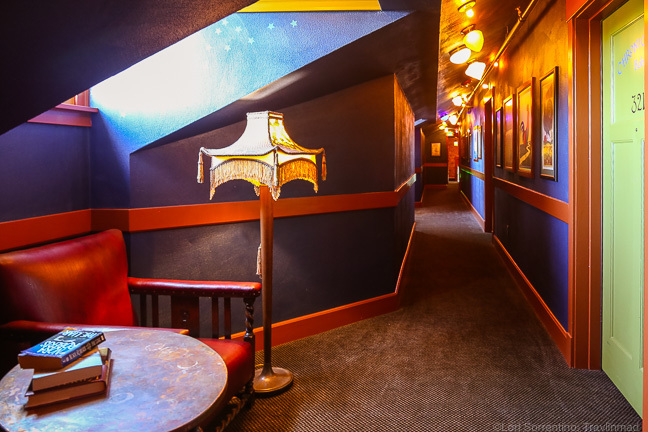 What's so exciting about McMenamins Grand Lodge hotel is how they've succeeded in honoring the long-standing Masonic history of the community by infusing it with the McMenamins whimsical brand. A stroll around the property and through the lodge is testament to that philosophy. Art and history are on every wall with numerous period photographs and documents along with historical references and short poems painted everywhere you turn, making it easy to romanticize about what life must have been like for the residents in their golden years. The McMenamins portfolio includes historic properties throughout Oregon and Washington state, all with a similar unique feel. On our last night in Portland, we experienced another one of their properties at McMenamins Crystal Hotel. It was a smaller property and certainly unique and funky, but didn't hold the impact of the Grand Lodge. There are 90 guest rooms in the Grand Lodge with whimsical artwork giving each room it's own distinct personality. Names of former residents adorn the doors of the rooms along the first floor hallway. There's a bit more of this on the second floor but some rooms have different titles like "The Lavender Room". By the way, if you happen to be in the vicinity of The Lavender Room and start to smell lavender, you're being visited by the "Lavender Lady" a former resident who loved lavender and who passed on years ago. We hung out there off and on while checking out the halls at night, but she didn't show. There are photos of the one-time residents on the walls in both the first and second floor hallways. More than anything, I think the photos connect you to the property. Knowing that you're staying in what was once someone's home is both comforting and poignant. No other hotel we've ever stayed in can compare with the quirky fun surprises on the third floor of the Grand Lodge. You exit the narrow elevator into a dimly lit hallway with a ceiling that's adorned with colorful light fixtures with dim bulbs - it was eerie and exciting at the same time. As we were scanning our key to open our room door, a little boy emerged from behind the wall directly across from our door and went running down the hall. We looked at each other with the same look of wonder. "Did we just see that...or was it...?" We won't spoil the surprise and tell you where to find the secret passageway. You'll just have to find it for yourself! Our room was in the recently completed third floor attic, with it’s still-vaulted ceilings. The rooms are all themed after a literary passage or book. 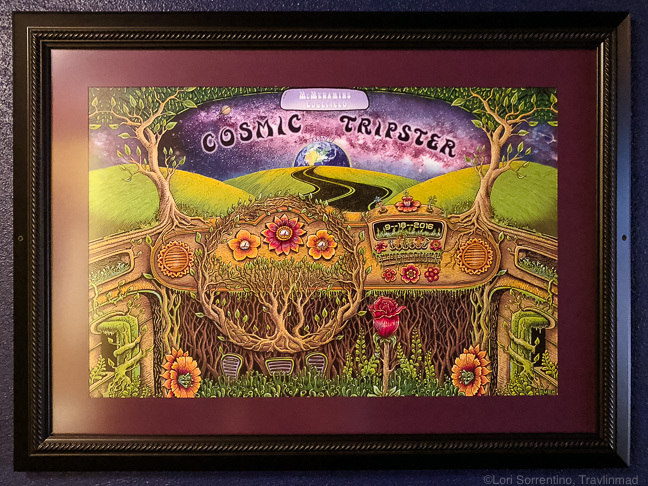 In our case, our room followed the book This Is All A Dream We Dreamed, an oral history of The Grateful Dead by Blair Jackson and David Gans - and it felt like one. Our spacious King room had a super-comfy bed with the wildest painted headboard ever! As you can clearly see, Jerry Garcia peered over our pillows as we slept (at first I thought it was Clink Eastwood!). The room had a large bathroom with shower and shelves for your things, a couch and chair for relaxing, and nice views over the front lawn. There was no TV in the room (a plus in our book) and strong wi-fi. The room featured two very cool windows: an arched dormer window with shutters to close at night, and a round stained glass porthole window set back into the wall. A wooden cover with two handles resembling a Viking shield sat in a wall pocket below the window. It took me until 5:00 am the next morning when the sky paled and woke us up to realize the purpose of the shield! McMenamins Ironwork Grill is the hotel’s casual restaurant at the center of the lodge near the front desk on the first floor. It's open daily for breakfast, lunch, and dinner - they even stay open late so you can enjoy their dessert sampler before you go to bed. Come on, when you're a kid, it's good to have ice cream before bed! Antique glass windows and iron scrollwork, that gave the eatery its name, keep the room as whimsical as the rest of the property. The menu is eclectic with steaks, pasta, salads and the chef's creations of the day. Many of the herbs and vegetables are grown on the property, and your breakfast eggs come from the resident chickens. There's also a courtyard where on a warm day you can enjoy your meal al fresco. Interestingly, we found a framed old photograph on a wall of a small group of men seated around a table at about the same place where we sat for breakfast. Artwork as an amenity? Absolutely. Art plays an important part in the design of the Grand Lodge, and in all of the historic properties owned by McMenamins. 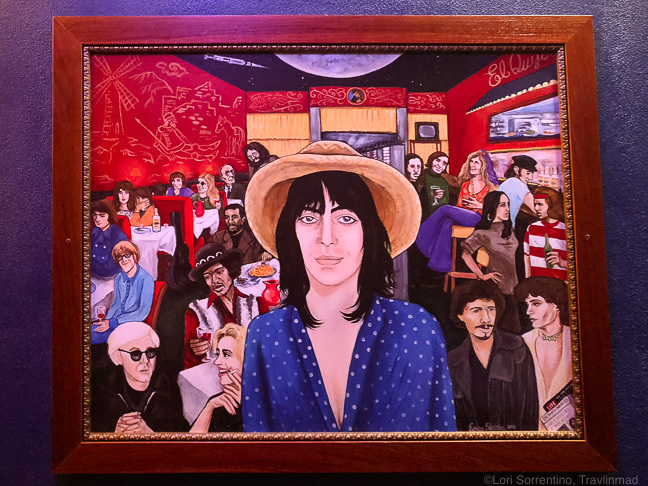 From the moment you check-in, you're tantalized by captions under the artwork, lyrical verses of songs, poems, or favorite stories of the McMenamins painted along the walls. Ask the Front Desk for the Walking Tour white pages and spend some time exploring the hotel once you get settled in that explain the backstories behind much of the art and the artists who created it. Feeling stiff or tight and a bit frazzled after your trip? There's no better way to relax and start your holiday than to schedule an appointment at McMenamins Ruby Spa on the lower level for a massage or maybe a facial and manicure. Ruby is a red-haired sorceress who appears in artwork throughout the property and is on the label of their Ruby Ale bottled beer. To get started and get your head right, enjoy a long soak in the outdoor heated soaking pool surrounded by natural rock formations and lush greenery, complimentary to Spa guests. Walk up the ramp directly across from the main desk to the Grand Lodge Theater. Movies are shown daily and for a small admission fee you can enjoy a movie in the comfortable deluxe rocker seats, or on one of the couches. The ambience is like a beautiful old-time theater, only this one has a state-of-the-art screen as new as the kick it sound system. All movies are closed captioned and there are special headphones for folks who are visually or hearing impaired. Thete’s also a concession stand right outside the theater entrance selling light snacks, soft drinks, and selections of McMenamin's brewed beers. The sublime heated soaking pool at the Grand Lodge is relaxing and always popular with kids, though it's not a diving pool. It's open daily and even later for adults. McMenamins has a very cool Passport program, and we saw at least a dozen people getting their Passport stamped over the course of a few days. So start your quest to become a Cosmic Tripster by keeping track of all the McMenamins locations that you visit. Get your Passport stamped by visiting a McMenamins location and completing a fun challenge to earn prizes like an exclusive Passport T-shirt or maybe a custom growler. Fill in all the regions and complete your Passport for the ultimate Grand Prize - three overnight stays and concert/movie tickets. Not only that, but we think the awarded title of Cosmic Tripster is pretty cool too! Click the Passport (right) for more info! When we said there's a lot to do for families and kids we weren't kidding. On the night we arrived, there was a huge inflatable movie screen on the front lawn right in front of Pat's Corner. Families gathered on the lawn with blankets and sleeping bags, kids were running around, and some folks were sitting around picnic tables enjoying dinner or pizza. When it was dark enough the projector started to roll and everyone quieted down. Then the movie's music started - JAWS! Seeing Jaws outside on a warm summer evening with a glass of wine was a great way to end our first night here. Wander down to the basement and you'll find a cozy bistro-like bar, formerly the Dentist's Office when residents lived here. Today, it's a great place to hang-out on weekends and shoot some pool or try out the many great beers on tap crafted by McMenamins. Pat's, named for the McMenamin brothers' mother, is open year round. If it's too cool to sit outside, no worries, head inside to enjoy your beverage of choice in front of the fireplace while they play one of the many records from Mike McMenamin’s collection. Look up at the ceiling and you'll get the picture - this is a vinyl and turntable music bar. Sweet! In warmer weather, you can order or take your food and beverages outside to a picnic table to enjoy free live music with your meal -- Thursday, Friday & Saturday nights. If you're into playing with your food (and what 10 year-old isn't?) ask about the on-site Fermentation Chamber where they're concocting all sorts of fun fermented foods like sauerkraut, giardiniera, curtido, vinegars and shrubs, and their signature Terminator malt vinegar. You can even sample their house-made strawberry rhubarb shrub in a featured cocktail at one of the several bars on site, and their homemade giardinera (pickled vegetables) is frequently featured on their menu. We can't say enough about our experience at McMenamins Grand Lodge, though it wasn't just the hotel we loved. It was the kind of experience a property like this offers guests, whether you're here for a romantic getaway or a family vacation. We loved seeing families interact and enjoy time with each other like we saw at the Grand Lodge - on the lawn, in the pool, in the restaurant. Kids ran around on their own exploring the property, catching fireflies - or a movie, rather than being glued to their phones. The lack of TVs in the rooms was so refreshing. The concept behind the pioneering McMenamins brand is also important to us - embracing history and the commitment to upcycling and repurposing. 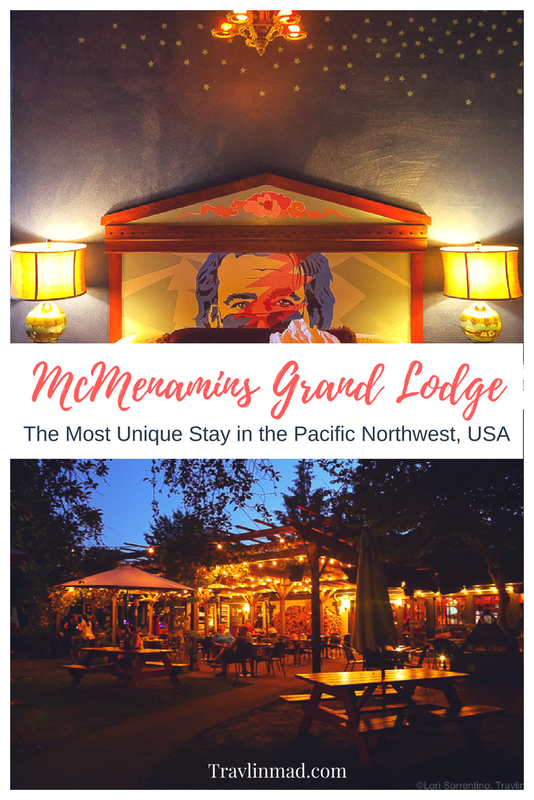 The saying "everything old is new again" has never been more true, but really should never be uttered until you've stayed at McMenamin Grand Lodge. If you're planning a trip to Portland or the Oregon wine country of the Tualatin Valley, book a stay here!